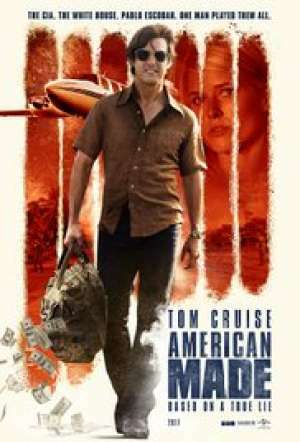 Film Review for American Made Starring Tom cruise and Sarah Wright.American Made starring Tom Cruise, Sarah Wright and Domhnall Gleeson is a far better outing than Cruise's last poor effort in a remake of The Mummy. American Made briefly is the true story of Barry Seal, an American Airlines pilot who decides life is more profitable as a drug / gun running pilot for a number of covert operations run by the CIA / DEA and Drug Cartels. Directed by Doug Liman of Edge Of Tomorrow fame and script writer Gary Spinelli, American Made delivers on many fronts. It is an action film that has Cruise narrating many well written comic lines. These lines explain the crazy nature of a life that exists in the underworld that the average person would find hard to believe. Cruise clearly enjoyed making this film and his performance reflects this. When it comes to comedy, Cruise knows how to deliver and clearly he has found a director who he feels can bring out the best in him. Domhnall Gleeson from About Time fame plays a CIA minder and also puts in a good performance as the straight guy who really is ' Mr Nobody'. For a good night's viewing, I recommend 'American Made'.